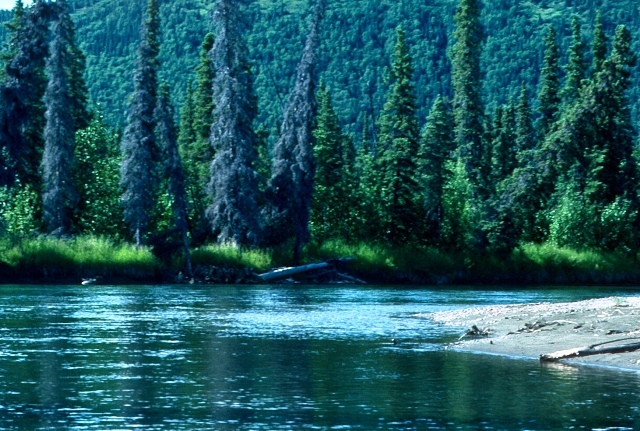 The Muchatna river is a tributary of the Nushagak River and is considered among one of the top fisheries in the region. The river can only be accessed by a plane with the put in at Turquoise Lake and the nearest take out 80 miles away. This is a true anglers paradise with virtually no competition for the five species of salmon that inhibit the Mulchatna. The Mulchatna also offers opportunities for Arctic Char, Grayling, and Northern Pike. Trips can be booked out of Anchorage, Alaska. All the information found on this Nushagak River fishing calendar is based on data compiled by the Alaska Department of Fish and Game, NOAA as well as other organizations. The Lunker’s Guide not responsible for the quality of this information, as these numbers are estimates provided by the best possible sources available. **For sports fishing seasons please refer to the ADFG fishing regulation pamphlet. This fishery generally allows 2 King Salmon over 20″ per day with an annual limit of 4 Kings over 20″. Other Salmon species 5 per day allowed. • 2 per day, 2 in possession, only 1 over 28 inches. • 5 per day, 5 in possession. Only one single-hook artificial lure or fly, or one single-hook may be used May 1–July 31. Boat: Primary techniques used are trolling plugs, side drifting eggs or back bouncing off the bottom. Bank: Drifting Roe, throwing hardware like spoons or spinners, twitching jigs, drifting beads or corky and yarn. Flyfishing: Stripping streamers, nymphing, and swinging.